Read more "Bold & Beautiful: Duro Olowu for JCP"
Da’Chic is a new small accessories business based out of my hometown of Los Angeles that was created and inspired by two friends of mine, sisters Joy and Felicia Masha. I am so proud of them for making their vision reality. Their line is chic[duh], beautiful, and affordable, and will make great gifts to give or gifts to self. So I’m spotlighting their brand today with a short interview. I hope you fall in love with it like I did. I think we’ll be seeing and hearing a lot more from the ladies behind Da’chic, so take heed! What obstacles did you encounter during the production process? With any new adventure obstacles are a given, it’s how you handle those obstacles that brings about the success Da’Chic Designs has seen these past few months since its founding. One obstacle we faced was making enough product to meet demands. It’s easy to underestimate your business in the early stages as you are determining whether or not your potential clientele is interested in coming back for more. Never underestimate your vision. You have to have a plan and work hard at it, even you it seems like the odds are against you. We missed out on opportunities that could have added to our clientele because we limited our product production. We later corrected our limitation, not only in product but also in our thinking. What inspired you to go down the avenue of accessories? We were inspired to go down the avenue of accessories having made a few skirts and shirts and had extra fabric left over. We didn’t want it to go to waste so we thought about accessories that would match our designs. 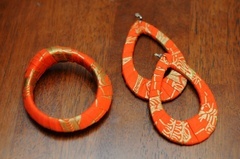 After we made our first pair of earrings the idea followed, what if we made chic accessories to chic-out any outfit. After that moment, Da’Chic Designs was born. Who is Da’Chic? Who do you see rockin your pieces? Da’Chic is the professional woman who was to add style to her work clothes without looking unprofessional, she is the teen who wants to set her style apart from the rest, she is also the everyday girl who loves fashion and knows she can chic-out any outfit with the right accessories. Do you plan to expand to a clothing collection or any other categories? 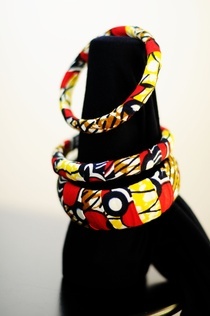 Da’Chic Designs, while focusing on accessories, also sells designed Dashikis and Africa inspired T-shirts. In the future we hope to launch our interior decor line. We believe fashion should not stop at the door, when it could be shown throughout one’s house.